Both events are vitally important to the light aircraft space I enjoy and as steadily reported on this website. 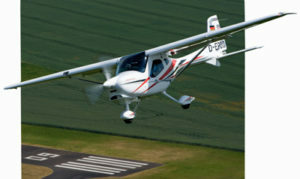 Both have strong sectors serving Light-Sport Aircraft (and in Europe, LSA-like aircraft) plus light kit-built aircraft and ultralight aircraft (in Europe called 120-kilogram class or SSDR, which means Single Seat De-Regulated). These classes of aircraft are the ones I love to report and probably the ones you also enjoy. The bad news and the source of my conflict is that this year, the two shows runs concurrently... darn it! Because "Beam-me-up-Scotty technology has yet to be developed, I have zero way to attend both. Fortunately, I have a plan. As noted in the "Welcome" text above, I will cover Sun 'n Fun 2017 and my fellow publisher, Roy Beisswenger of Powered Sport Flying will attend and cover Aero 2017 for ByDanJohnson.com. Thanks, Roy! I'm irked I cannot attend Aero this year for another reason: it is the 25th anniversary event. Organizer and Aero project leader, Roland Bosch, said, "The entire spectrum of modern ultralights, gliders, and [larger] aircraft, as well as business jets, will be exhibited at the show." I enjoy his leading emphasis on the light side, where Aero truly got its start a quarter century ago. Roland also noted the e-flight air show taking place one day before the opening of the anniversary Aero. "We want to give you exciting insights into the world of flight and offer you the opportunity to talk with experts." What I consider to be the largest, more interesting show in Europe is up in exhibitor bookings for 2017. More than 630 are expected. 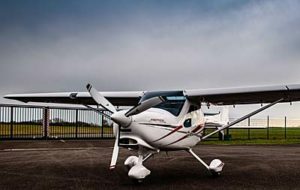 They welcome back GA heavyweight Diamond but more important to our readers, Tecnam will be back after an absence of two or three years. Tecnam will be showing off their supersized Traveler, an 11-seater aimed at the regional airline market, but they will also be showing their new version of the Sierra, the Mark 2. In a reversal of the usual situation, Americans have already seen this one, just a few weeks ago at Sebring 2017. Now, Europeans will get to examine the newest member. Tecnam has larger aircraft, certainly, but they are still most attentive to the LSA market, where their numbers remain strong. German LSA producer, Remos debuted their superb GXiS at Aero 2016 last year. It was a pleasure to see this handsome aircraft again displayed after the Pasewalk-based company recovered from their court-ordered reorganization. Remos appears financially healthy again and their aircraft has long been one I admired. See this article for more thoughts on how it flies. I judged as extraordinary the job Remos engineers did implementing the wonderful but somewhat more complex Rotax 912iS engine. Beyond that, the GXiS is a beautiful example of what the world calls "German quality." The machine is beautifully appointed and delivers great ease of use. Remos communications guru Patrick Holland-Moritz noted, "GXiS takes just one push of a button to start the engine. Almost all preflight checks will be done automatically." I liked that; you might, too. Continuing their pilot-friendly refinement of this already impressive aircraft, engineers will unveil a new "jet throttle" in the center console that combines the control of power and wheel brakes in one lever. See more and talk to the team at Aero in Hall B3, Booth 107. The B1-2-3-4 halls, each the size of a gymnasium (see arrow), contain most of the aircraft we cover on this website although a few are located in the southern row of A Halls. With 50 employees, Remos builds GXiS and GXNXT (called GXnXES in American). These flying machines reside in 1,320-pound (600 kg) LSA category and in the European ultralight category that maxes out at 472.5 kilograms (1,040 pounds) gross. The company reports more than 450 Remos models are flying all over the world with about 120 in the USA. We are fast approaching an important time of year… only this year I am a bit conflicted. 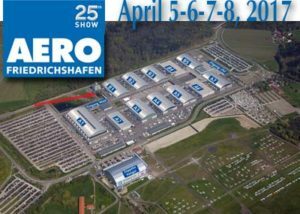 The good news is Sun ‘n Fun and Aero Friedrichshafen are terrific shows. I have been attending both for more years that I care to admit. (OK, I guess I don’t ming saying Aero 2016 was my 20th in a row. I’ve been going to Sun ‘n Fun so long, it makes me feel old to say how many years it has been.) Both events are vitally important to the light aircraft space I enjoy and as steadily reported on this website. Both have strong sectors serving Light-Sport Aircraft (and in Europe, LSA-like aircraft) plus light kit-built aircraft and ultralight aircraft (in Europe called 120-kilogram class or SSDR, which means Single Seat De-Regulated). These classes of aircraft are the ones I love to report and probably the ones you also enjoy.